The original idea for this section went as follows: “The five mains have to solve a sphinx’s riddle to get an artifact for a quest, and manage to deter the Sphinx with a terrible outside-the-box answer that the sphinx has to ‘Call in.’ A mention about motivations is made to segue into the chapter.” I’m not sure which of us came up with this idea in the planning stages, but Phil wasn’t really into it when we sat down to write actual pages, and it was his segment to write, so we junked it. Introducing Gravedust’s Vit-O-Vision! Your soul does not have to be postmortem for him to see it! I don’t think we planned to have his clipped tactical assessment reinforce the theme of “parties of five” that would keep cropping up in the series, but it’s nice how that worked out! 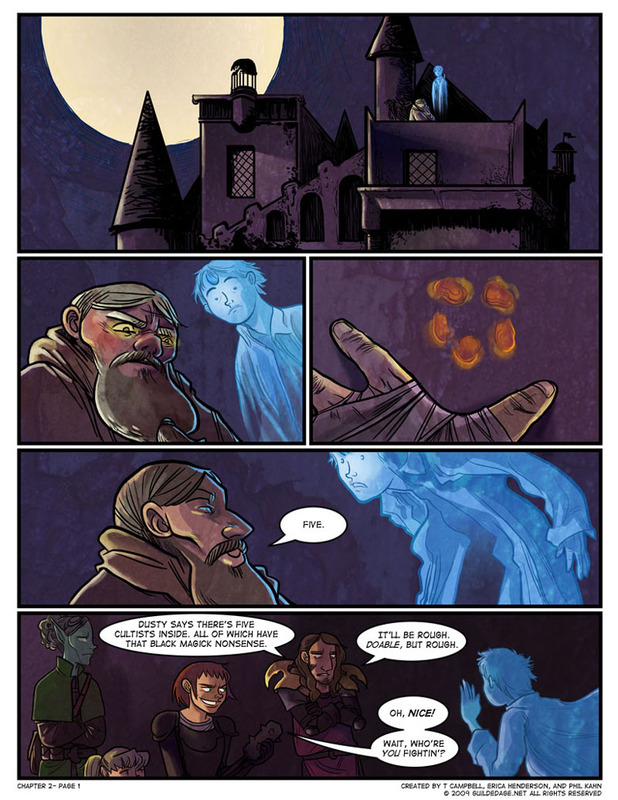 The heroes can see Martin the Ghost Boy, but not hear him without Gravedust’s presence, so Martin resorts to “ASL for dummies” to convey what Dusty has discovered. His backstory is not explained, but one imagines that he’s a victim of the Cultists, who, as we will later establish, are especially likely to prey on children. That would mesh with Gravedust’s mission to give the spirits he encounters purposeful ends. Phil and I went back and forth a bit on Byron’s reactions here. Was he the bubbly, bouncy morale booster who saw almost any challenge as fun to overcome (“It’s totally doable, guys! Can we break it? Yes, we can!”) or the seasoned professional with realistic expectations (“Five magicians, guys. It’s gonna be rough. “)? It wasn’t completely either-or, but we increasingly pushed him into a more “adult,” measured attitude because, basically, somebody had to be the adult in the room. All four of his comrades seen here would eventually do some leading of others, but at this point, none of them are ready for that: Gravedust has too big a chip on his shoulder and the others are too immature. Even Syr’Nj would need another couple of chapters’ worth of seasoning. I somehow seem to have missed this chapter! how exciting! How do you pantomine “all five of them have that black magick nonsense”? Ghost charades – seems like a missed opportunity for comedy, had it been fleshed out, so to speak. I’ve seen the word segue in print and figured out what it meant, and I’ve heard it spoken and figured out what it meant, but until just now I had no idea it was the same word. I always assumed it rhymed with leg, and I swear I heard it said as seg, and it’s still weird to me to hear it out loud. My own personal Mandela effect, I guess.